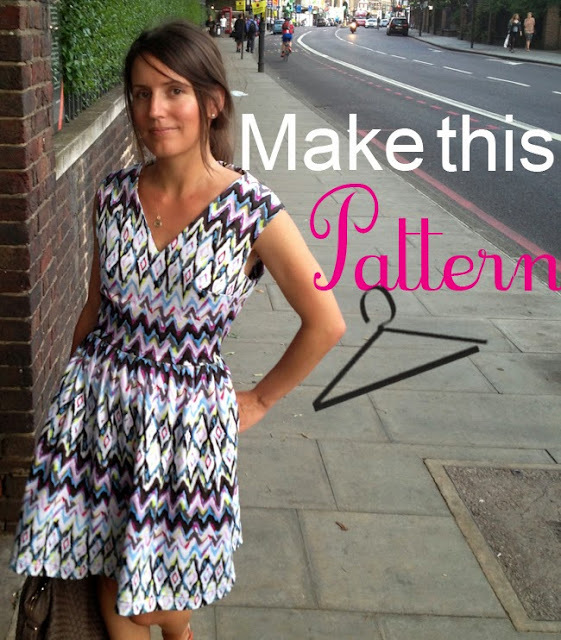 It's Part 2 of Make this Pattern for the Summer and the City dress. Just a quick reminder - normally you would work from a block without seam allowances and add them in at the end. 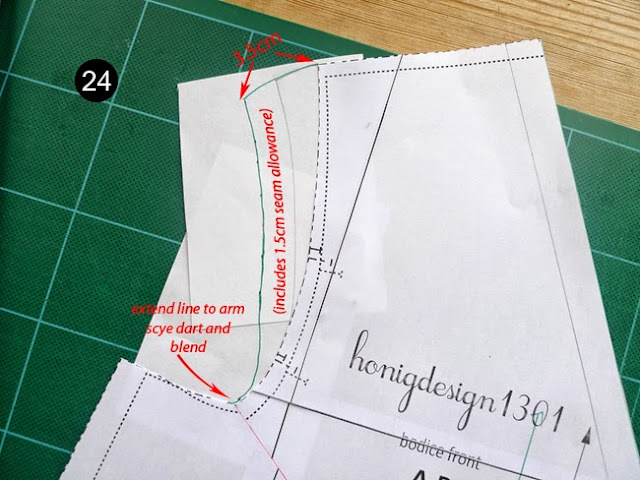 Since we are working from a bodice pattern that already includes 1.5cm seam allowances, we have to include them on the style lines we draw in to create the v-neck and cap sleeve. 23) a) On the bodice front, measure in 3.5cm from the neckline along the shoulder and mark. b) Measure 12cm down from the neckline on the centre front and mark. c) Connect these two points with a straight line. These measurements account for the 1.5cm seam allowance included in the pattern. d) Make a notch where the sewing line meets the centre front. This is the pivot point when you sew the vneck. 24) a) Glue a scrap piece of paper along the bodice front arm hole, extending all the way to the side seam. b) The shoulder of the bodice on this pattern extends out over the top of the shoulder somewhat. 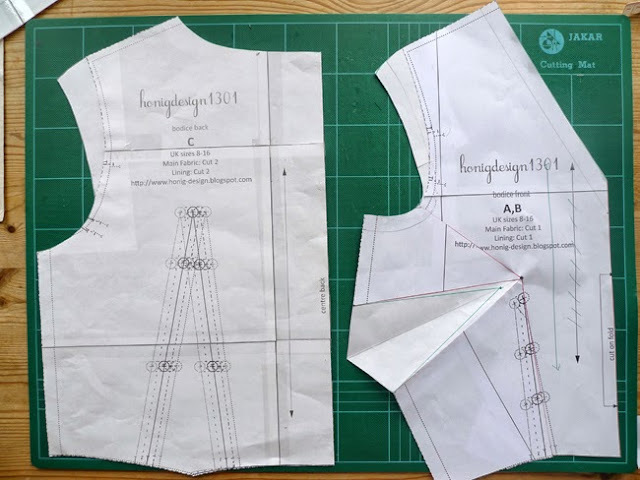 Draw a slightly curved line outward from the tip of the shoulder measuring about 3.5cm (the exact length of the line is up to you, just remember that it needs to include the 1.5cm seam allowance). This is the cap sleeve. c) From the end of the cap sleeve, draw another freehand line which meets the arm scye dart. Remember that this will include 1.5cm of seam allowance. The next step is up to you. I've dropped the arm hole a little because I prefer to wear sleeveless garments with more room in the arm. (I don't particularly like when the fabric rubs up closely against my underarm, especially for summer garments!) I also think it works better with the v-shape of this pattern. This is totally up to you, I know many sewers feel the opposite way. 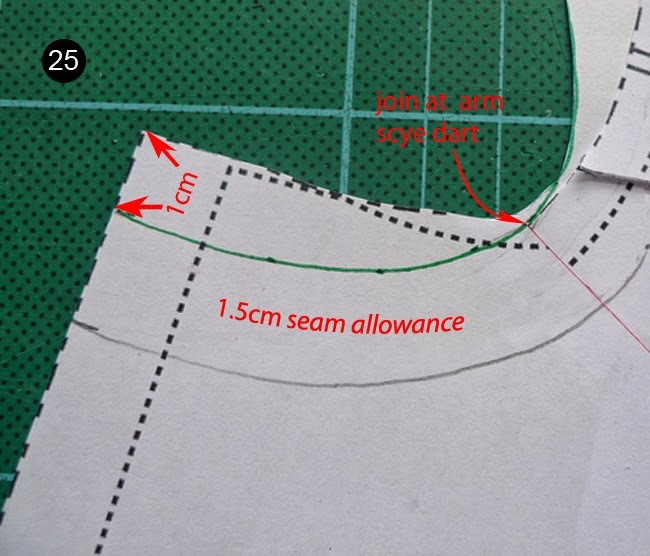 25) Measure 1cm down from the arm scye and draw a freehand curved line to join at the arm scye dart. Now we have to make sure the bodice back matches wht we've done on the bodice front. 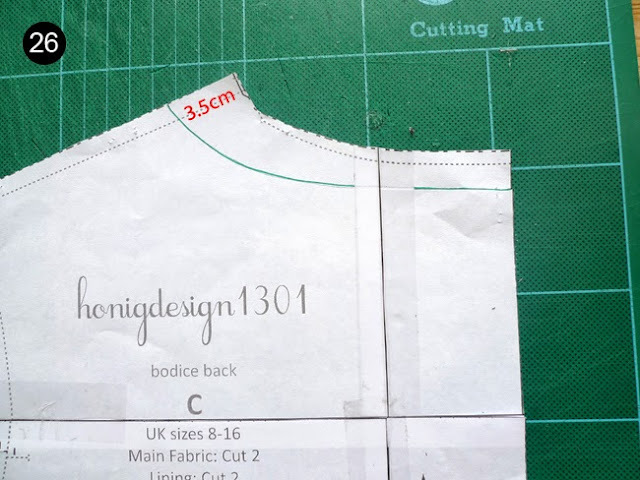 26) Measure 3.5cm from the neckline on the bodice back and draw a curved line to the centre back, dropping it slightly. 27) a) Glue a sheet of scrap paper along the arm hole for the bodice back. b) Take your pattern for the bodice front and place it on top of the bodice back, so that the shoulder seams line up perfectly. Trace the new cap sleeve onto the bodice back, and the line which connects to the arm scye dart, so that you have a matching front and back. 28) If you've dropped the arm hole on the bodice front, make the same adjustment on the bodice back, measuring 1cm down. You should now have a bodice front and back that look something like this. - Measure your shoulder seams - do they match? 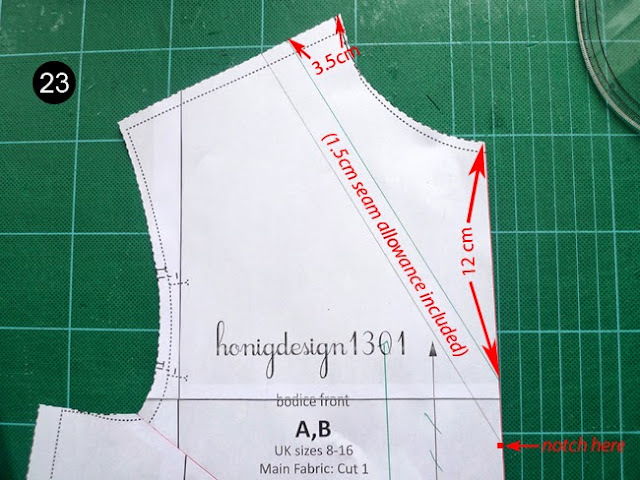 - Measure your side seams (excluding the dart excess on the bodice front) - do they match? As with any garment you draft, it's really important to sew a quick muslin to see if any further fit adjustments need to be made. Click here for Part 3 - a few tips on sewing it together, and show how I made the pocket for the dirndle skirt.